A handful new cocktails joints have opened up in SoMA/FiDi recently, but we haven't covered any of them because, frankly, most of them are lame. Novela was the first place we've been to that really blew us away. 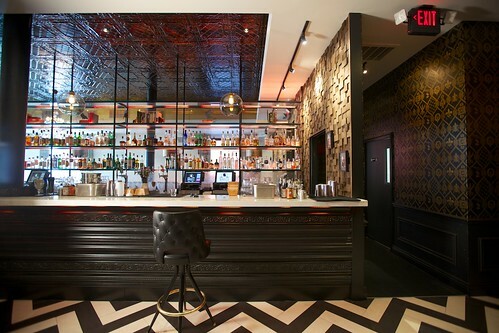 We were most impressed with the thoughtfulness that went into this bar program. 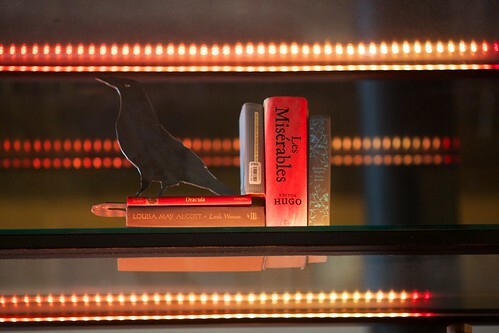 The whole place, from design to drinks, is literature themed––Novela is Spanish for novel. Noelle and I were both blown away with both the concept behind the bar program and the execution of the drinks. The cocktails are all named after famous literary characters––Atticus Finch, Jay Gatsby, etc––and are designed to by simple tweaks of classics. For the cocktail review (there will be a punch review later), we tried the Leopold Bloom, a play on a julep. 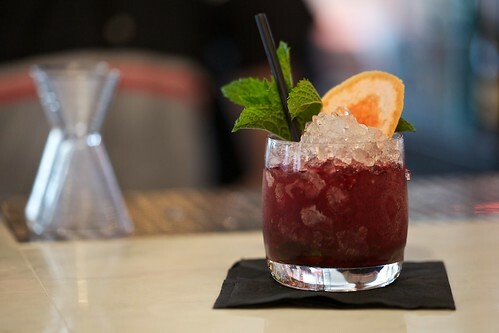 Leopold Bloom–– 2 oz hibiscus infused gin, .5oz pineapple syrup, mint (a few sprigs). The hibiscus and the gin make this a much drier cocktail than you'd anticipate. The pineapple balances out the dry gin and evokes more of the citrus notes of the hibiscus gin. I loved this drink. 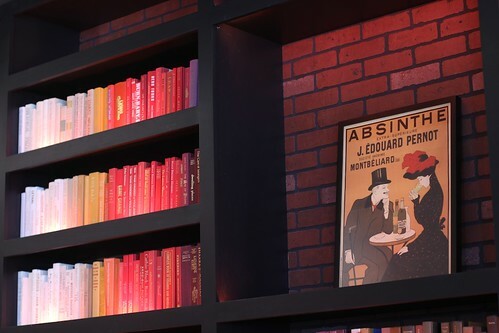 The walls are covered with books, organized by color. The nifty thing is, these aren't phony books, they're legitimate titles. I had fun ambling around seeing what I recognized. 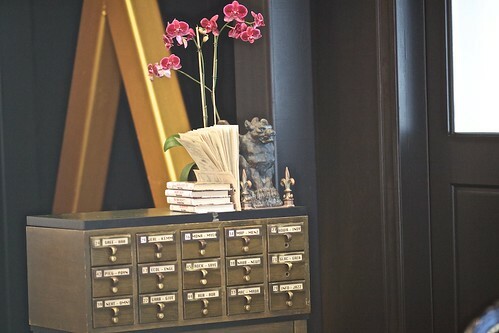 There's even a card catalogue in the front, for those of us who remember what those look like. 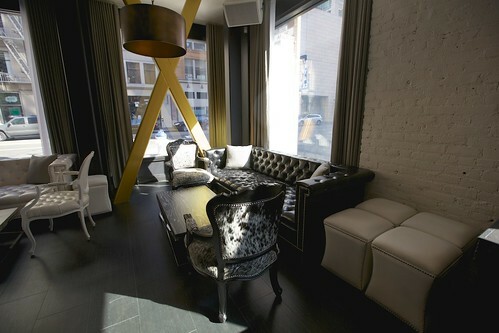 There are lots of comfortable couches and chairs that provide an intimate group setting, giving the place a surreal, study-like quality. 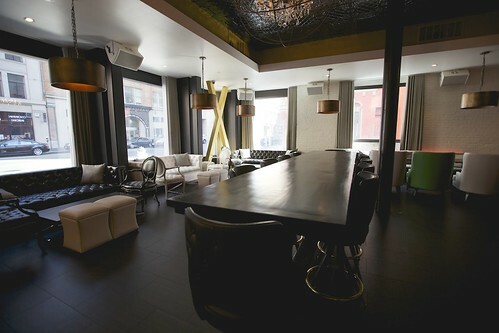 Communal tables provide space for larger groups, which is perfect for big happy hour groups. 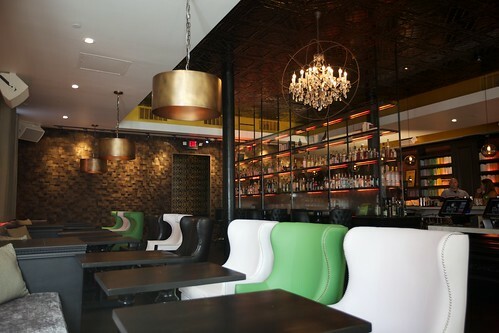 The place is bonkers for happy hour, by the way, so if you're looking for a good scene, head to Novela between 5pm-10pm.